California’s governor, who has a history of wrangling with the Clintons and the Democratic establishment, makes a case for anti-Trump unity. Jerry Brown, a strikingly successful and popular governor in his own state of California whose approach is often held up as a model for Democrats nationally, refused and refused and refused to endorse a candidate during the course of the long race for the party’s presidential nomination. Brown, whose three previous bids for the presidency suggested to some that he might harbor an interest in one last run, and whose relations with front-runner Hillary Clinton had not always been good, kept on the sidelines. Until now. Brown’s case for Hillary Clinton in 2016 is unlikely to impress ardent supporters of Clinton’s rival, Vermont Senator Bernie Sanders, who has surged in recent California polling and who is drawing large crowds at rallies across the state. Sanders backers will stick with Sanders when the state votes on June 7; in fact, a substantial number of them have already cast early ballots for the progressive challenger. But Brown still speaks to Sanders supporters in an “Open Letter to California Democrats and Independents” that was posted online Tuesday morning, as he does to voters who might be leaning toward an insurgent campaign that feels in some ways like the governor’s own late-stage bid to upset Jimmy Carter’s march to the Democratic nomination in 1976 and in other ways like the governor’s outsider bid for the Democratic nod in 1992. That is the sort of conventional wisdom that Brown once challenged, especially in 1976, when he opened a late-stage bid for the Democratic nomination at a point when Carter had established a clear lead. And in 1992, in those bitter debates with Bill Clinton, Brown had no qualms about suggesting that Democrats ought to consider his maverick bid because he would be a stronger November contender. Brown provides something of a model for Democrats who haven’t been enthusiastic about Hillary Clinton to back her. Sanders backers make similar arguments today, pointing to polls from November battleground states where he runs better than Clinton against Republican Donald Trump. But Brown’s own experience—his challenges to the party establishment in 1976, 1980, and 1992 fell short—appears to have given him a different perspective about the dynamics of primary and general elections. Whatever the polls may suggest now, the governor says he is of the view that Clinton is better prepared to trump Trump in November. Once dismissed as an overly idealistic political figure, Brown has emerged in his latest incarnation as a progressive pragmatist who maintains a tight focus on what he sees as politically possible. He speaks as a man who did his time in the political wilderness before a comeback that has made him the mayor of Oakland, California’s attorney general, and now a governor widely credited with ably managing the affairs of a state that just before his election had been labeled “ungovernable.” He wins statewide races with ease, gets voters to back taxes on millionaires and billionaires, and uses the money not just to balance budgets but to invest in education and infrastructure. And he is moving California into the front of the debate about climate change. 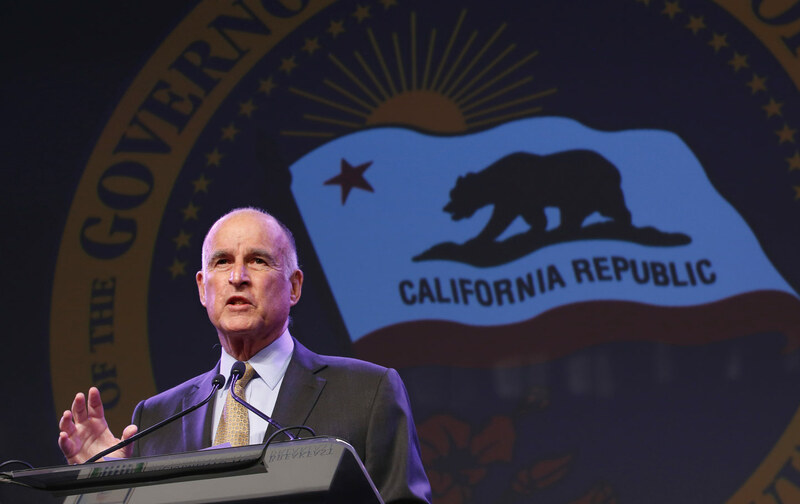 Brown has reason to be confident about California politics, which he has mastered over the course of an electoral career that began almost 50 years ago. But he has concerns about the rest of the country, and those concerns clearly influenced his decision to back Clinton in the Democratic race. Indeed, the rise of Trump, and the threat of a Trump presidency, emerges as a central concern in Brown’s late-stage endorsement. And the endorsement, in turn, provides something of a model for Democrats who have not always been enthusiastic about the Clintons, or other established Democrats, to argue for Hillary Clinton as a 2016 Democratic nominee. That model has meaning for Democrats far beyond California. “[There] is more at stake than mere numbers,” Brown writes with regard to the details of the Democratic contest. The Republican nominee, Donald Trump, has called climate change a “hoax” and said he will tear up the Paris Climate Agreement. He has promised to deport millions of immigrants and ominously suggested that other countries may need the nuclear bomb. He has also pledged to pack the Supreme Court with only those who please the extreme right.